Background The goal of universal health coverage (UHC) requires inter alia that families who get needed health care do not suffer undue financial hardship as a result. This can be measured by the percentage of people in households whose out-of-pocket health expenditures are large relative to their income or consumption. 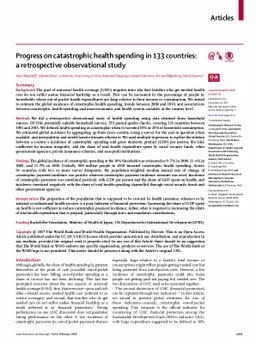 We aimed to estimate the global incidence of catastrophic health spending, trends between 2000 and 2010, and associations between catastrophic health spending and macroeconomic and health system variables at the country level. Methods We did a retrospective observational study of health spending using data obtained from household surveys. Of 1566 potentially suitable household surveys, 553 passed quality checks, covering 133 countries between 1984 and 2015. We defined health spending as catastrophic when it exceeded 10% or 25% of household consumption. We estimated global incidence by aggregating up from every country, using a survey for the year in question when available, and interpolation and model-based estimates otherwise. We used multiple regression to explore the relation between a country’s incidence of catastrophic spending and gross domestic product (GDP) per person, the Gini coefficient for income inequality, and the share of total health expenditure spent by social security funds, other government agencies, private insurance schemes, and non-profit institutions. Findings The global incidence of catastrophic spending at the 10% threshold was estimated as 9·7% in 2000, 11·4% in 2005, and 11·7% in 2010. Globally, 808 million people in 2010 incurred catastrophic health spending. Across 94 countries with two or more survey datapoints, the population-weighted median annual rate of change of catastrophic payment incidence was positive whatever catastrophic payment incidence measure was used. Incidence of catastrophic payments was correlated positively with GDP per person and the share of GDP spent on health, and incidence correlated negatively with the share of total health spending channelled through social security funds and other government agencies. Interpretation The proportion of the population that is supposed to be covered by health insurance schemes or by national or subnational health services is a poor indicator of financial protection. Increasing the share of GDP spent on health is not sufficient to reduce catastrophic payment incidence; rather, what is required is increasing the share of total health expenditure that is prepaid, particularly through taxes and mandatory contributions.